Thank you for joining our tour on June 25th, Saturday. We welcomed 30 guests in four groups from USA, Australia, U.K. Sweden, Belgium, Russia, Canada, Germany, Switzerland, Singapore and Japan. We were worried about weather in the morning but no rain. It was cloudy sky and it feels good when wind blows. I visited Kumamoto castle earlier this month. A powerful 7 magnitude earthquake struck southern Japanese island of Kyushu on April 14th and April 16th. Kumamoto castle was badly damaged including 13 important cultural assets. The castle was built in 1607 by Kiyomasa Kato. Even though main castle tower was reconstructed in 1960, many of the stone walls are originals from the 17th century. The estimation of repair cost will be 35 billion yen. However, over 400-year old original stone walls are survived from the strong earthquake! Stone walls were damaged only partially. Today, I was looking at the stone walls of Edo castle at the East garden which also built over 400-year old, I thought legacy technologies were amazing. We welcomed 13 guests from France, Argentina, Sngapore, U.K., U.S.A. Some guests couldn’t find Tokyo Marunouchi Exit easily but we could start our tour after 10:00am. We divided the guests into 3 groups. clearly. Especially many mushrooms in the Honmaru laon area were small and so cute. It’s a rainy season in Japan and also a season of “Sansai” or edible wild plants. My brother who lives in Yamagata prefecture (northeast part of Japan) got “Hosodake” a kind of edible wild plants in his near mountain, and sent me some of them. “Hosodake” hunting isn’t a easy job, because “Hosodake” is usually grow up in a hurd place. I cooked “Hosodake” as a miso soup. It was so tasty. I hope guests to Japan enjoy the season event of our nation. ・We leave at 10:00 . Please take care to arrive on time !! Thank you for joining us. On that day we welcomed around 40 guests from USA, Israel, Nederland, U.K. Deutschland, Ostrreich, Ireland, Mexico, Sweden, Poland, Australia, Singapore, Malaysia and China. We divided into 6 groups. It was really hot day. The temperature rose to 32 centigrade. The sky was clear and the sunshine showered us directly. 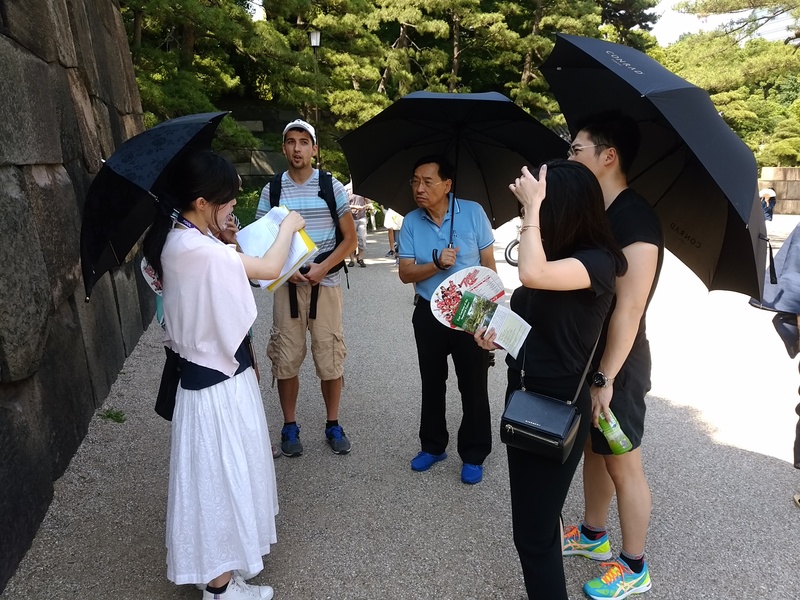 So some of the guests brought parasols borrowed from the hotel as well as some of the guides did. These days parasol, which we call Higasa has become very common. Some parasols can be used as umbrella in a rain as well and some have cooling function in it. Even men use that. We highly advise guests to bring ones together with water and hand-fans to blow the air. Japan’s summer is not just hot but very humid. That is the main reason that pre-modern time buildings are mostly made of timbers. Timbers can absorb moist in the air. Inside a stone building, without proper air-conditioning, walls are covered with moist which makes residents very uncomfortable. But wooden buildings could easily catch fire. That is why castle buildings are gone and the premise turned flat green turf. Only architectual remains in the East Garden are stone bases and a stone celler. The stone celler was to keep valuables from fire. That is why it still remains as it was. So wooden buildings cannot last so long? Actually Japan has the world’s oldest wooden buildings. One is Horyuji Temple in Nara prefecture. It was built in 7th century. In Kyoto, located right next to Kyoto Station is Toji Temple, which contains the tallest wooden structure in Japan at present time, 5 story pagoda, 51 meter high. It was built in 17th century. 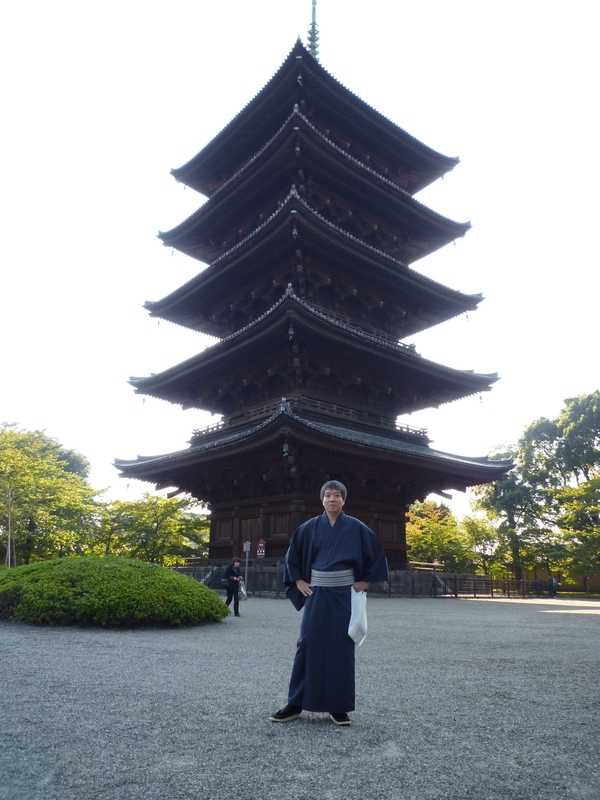 The pagoda may have been one of the tallest wooden structures in the world at that time. Still today, most common building for residence is wooden-made. Very suitable for the climate in Japan. Please come to Japan and feel humidity. Then anyone can appreciate wooden-made houses. We welcomed 13 guests from U.S.A , Sweden, France, Singapore. 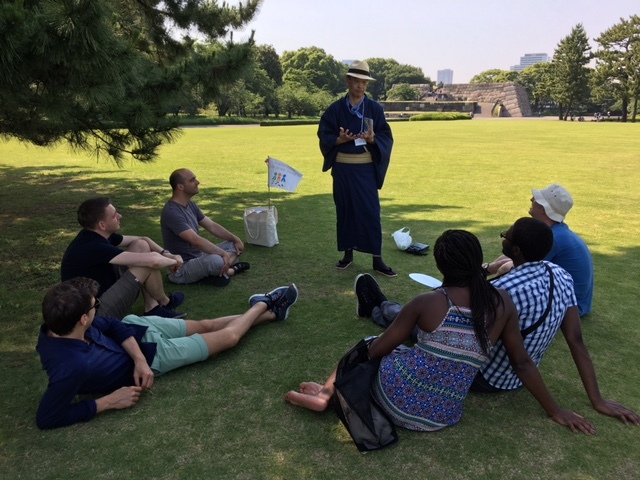 We divided the guests into 3 groups and started our tour 10:00 a.m. from Tokyo Station. It was so humid but slight wind helped us a little. If you are in Tokyo on the day. Why not come and join us? Please check the tour calendar on our website. Thank you for the guests kindly joined our Saturday tour on 11th of June. We had nearly 30 guests from several countries, by five groups. The sunlight is already the one in summer, so we looked for the sunshade place at each guide points. In Tokyo, we can enjoy the several kinds of flowers from February to June (of course, it is subject to the temperature in each year). Presently, we can enjoy iris flower at Ninomaru Park. It is the best season to see it now. In February, we can enjoy the plum tree flower, and do you know we do enjoy the fruit after the blooming. It is called Umeboshi. It is VERY sour, but popular as one of healthy foods. It makes our body to be neutralized. At your first try, you will be very surprised its sourness, but it is worth to try it. I recommend you to do it! In June, we can enjoy the hydrangea flowers as well. I feel it is more beautiful in rainy days, because it is the flower in rainy season. Rainy season usually makes us uncomfortable, but the hydrangea flower on the street side makes me happy in rainy days. Flower always gives us the power, I believe. ・We leave at 10:00. Please take care to arrive on time! ・Participants : Froeign tourists and risidents, and their accompanying Japanese friends, families , etc. = For more information on our tour, please visit our website, Facebook, and Trip Advisor ! Thank you for the guests kindly joined our Saturday tour on 4th of June. We totally had 39 guests from 13 countries, by five groups. It was cloudy and windy,but not so bad. We hope all guests enjoyed this walking tour with us. While walking together, we can enjoy talking about various issues. On that day, we talked a liitle about Japanese 6 year boy who had been missing in the mountain for several days, and was found alive. The news were broadcast widely and caused a lot of discussion whether his father’s treatment to the boy, he left his son alone there for a couple of minutes,was OK for home discipline. Each guest had each opinion based upon his or her background, but we came to conclusion that the kid was amazing and we were relieved with this happy ending. 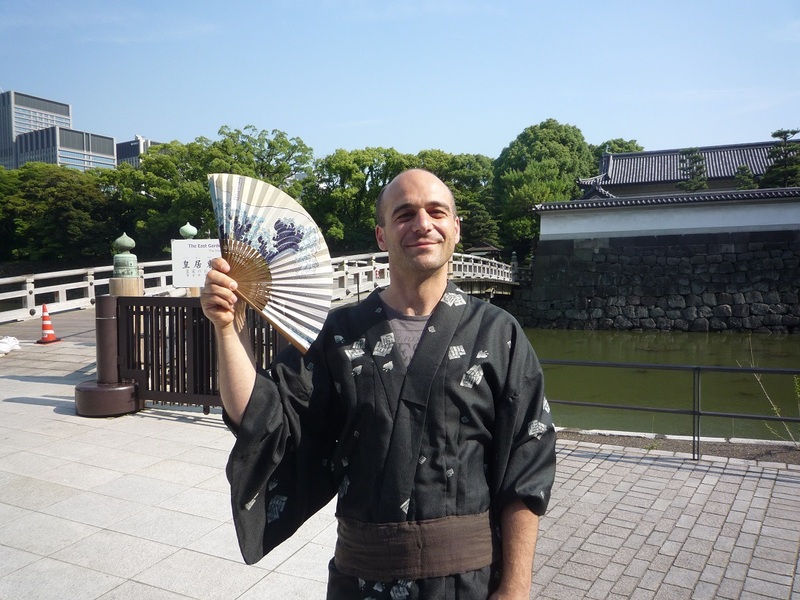 After this two and a half hour tour, you can try one-touch Kimono as a part of happy ending. Please come and join us! !